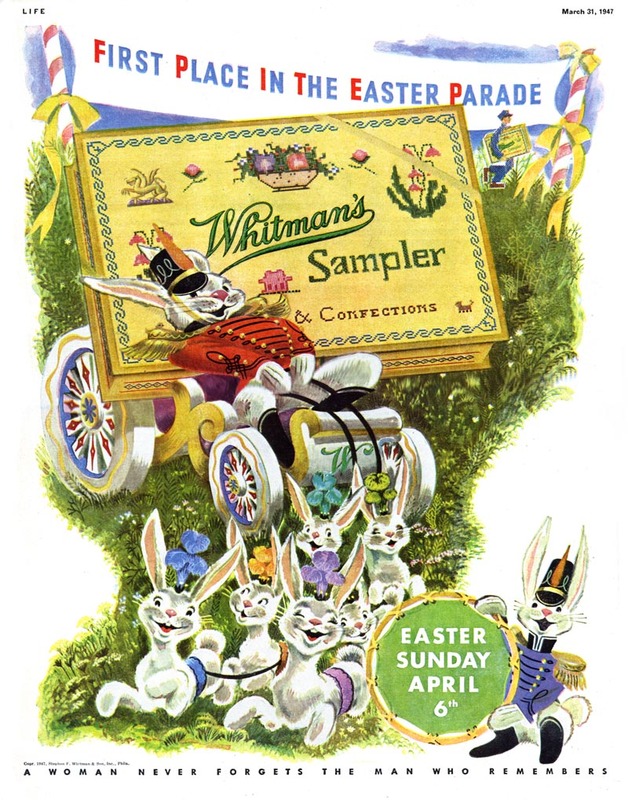 Sheilah Beckett recounts for me how she came to join the Charles E. Cooper studio during the early days of her illustration career. "I had a friend from Portland, Oregon who worked at the Cooper studio," she explains, "so I knew about it... and I went to see Chuck to ask what to do; should a get a representative or what - because I knew Cooper's was a men's studio - and he asked me to join." "I was the first woman Chuck ever took on." Sheilah began working as an illustrator immediately. "I had my own work doing children's books and I took on what ads Chuck could get me. The salesmen were great." Describing her work space at Coopers she says, "I had a very small, very nice studio right next to Chuck. Every person there had his own room. It was just the most ideal situation for an artist. Just heaven!" 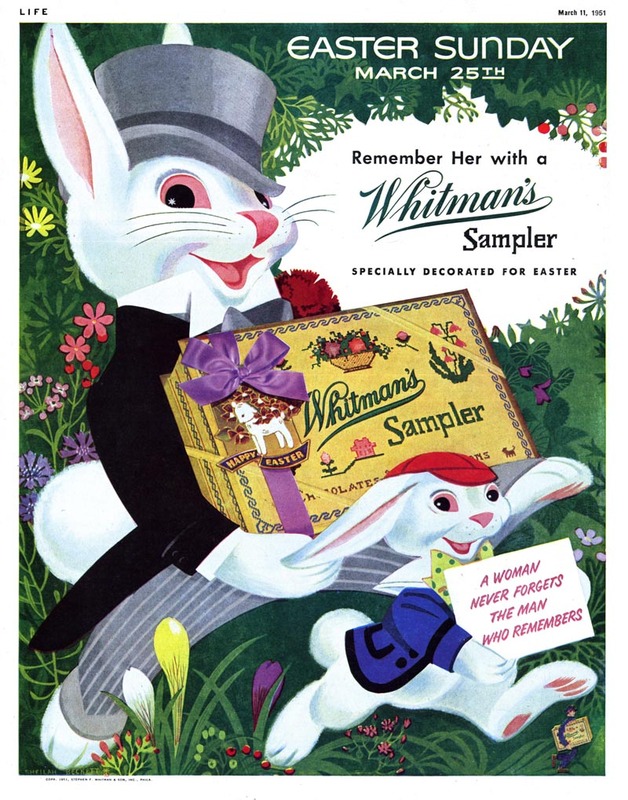 Sheilah seems to have had some steady accounts through Coopers - for Whitman's Chocolates and Necco Wafers at the very least - but she says she didn't get a lot of advertising assignments. 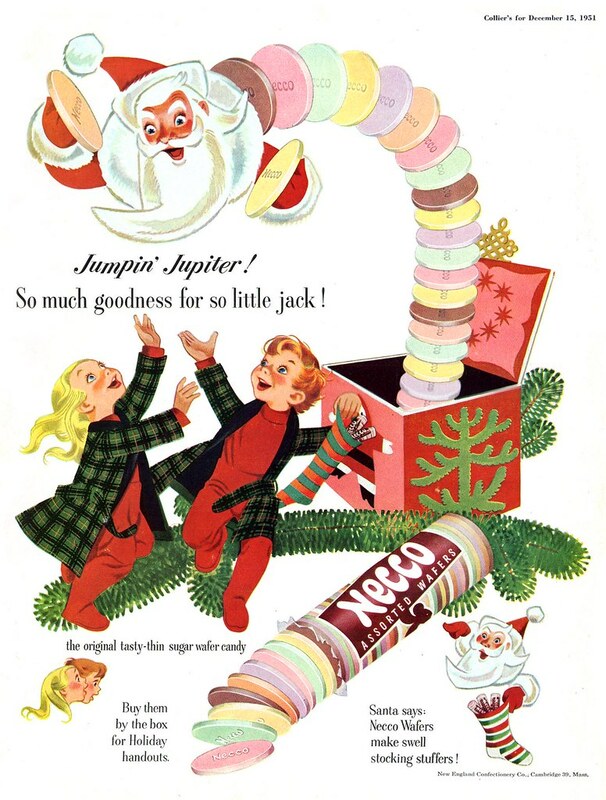 The advertising art paid comparatively well, but, "I loved doing Christmas cards and I loved doing children's books... and I was busy with that." 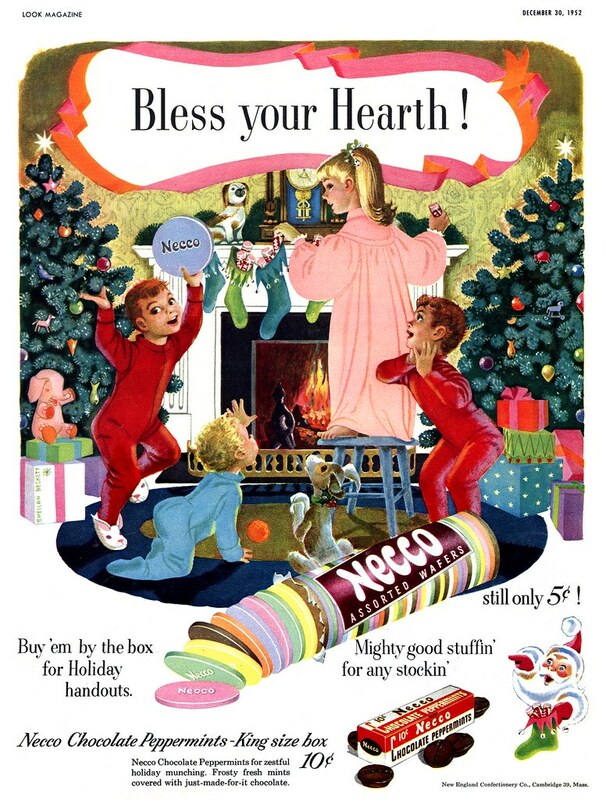 When I ask her about her Necco Wafers ads she says with great emphasis, "Oh, they're awful! The drawing is so... so... I don't know... " she chuckles, "it isn't very great." I assure her that they're wonderful and much admired by those of us who enjoy seeing her work. 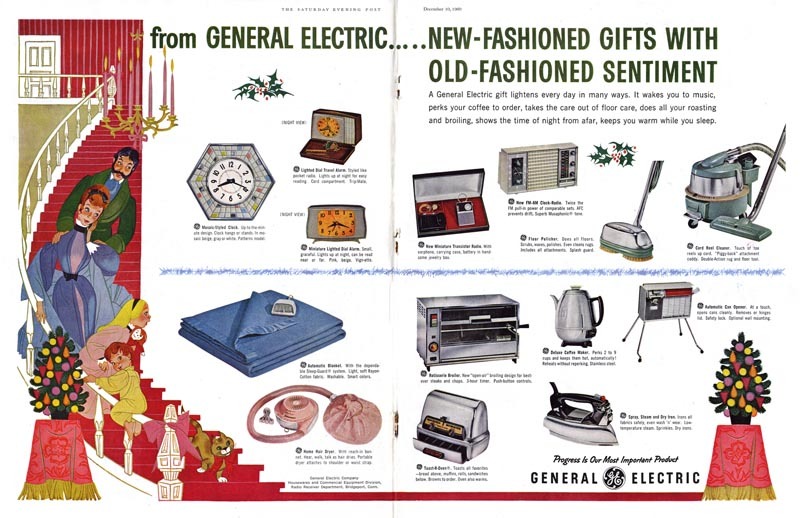 She remembers, "There was one ad that you don't have that was better than all of these others." 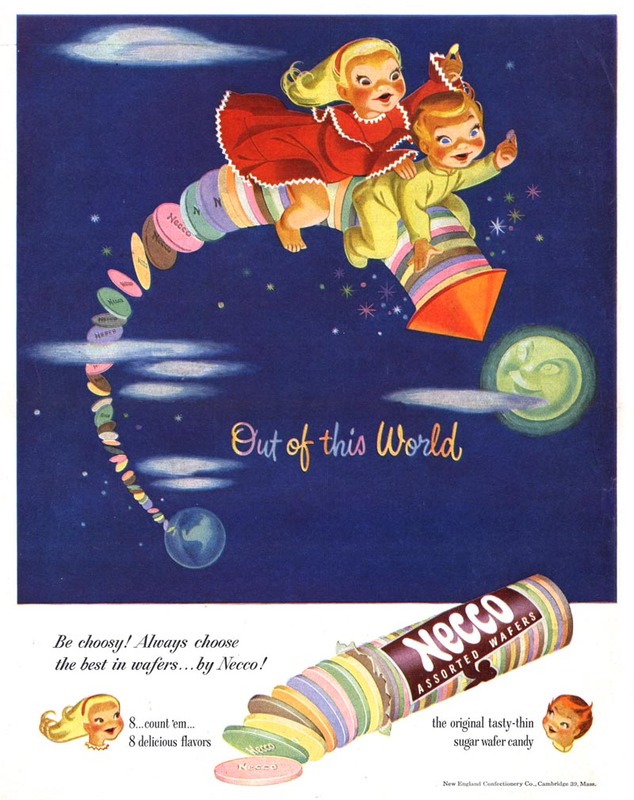 Today, while hunting through my files for anything I might have overlooked, I came up with one more Necco Wafer ad - the 'rocket ship' scenario reproduced larger below. I hadn't had a chance to check with Sheilah or her son, Sean, before preparing this post, but I'm hoping that when she sees it, it'll be the one she was referring to and that it will be a nice surprise for her to see it again after all these years. 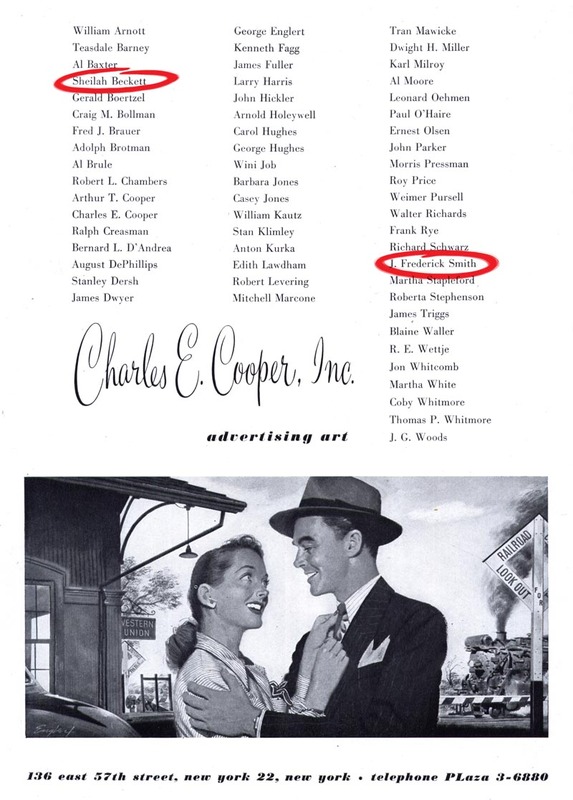 In the ad from 1942, below, you'll notice that Sheilah is not yet listed as a Cooper artist - but her husband, Frederick Smith, is. When we spoke on the phone Sheilah remembered them both being represented elsewhere for a short time before they moved up to Coopers. This ad seems to indicate that Smith moved there first. The next volume I own is from 1946. This time, both Sheilah and Frederick are listed. But because of the gap in my collection, I can't say for sure what year Sheilah joined the studio. Also curious is that even in the '42 ad some women are listed. Edith Lawdham, Sally Quinn, Roberta Stephenson and Mary Tinker are names I've never come across before. 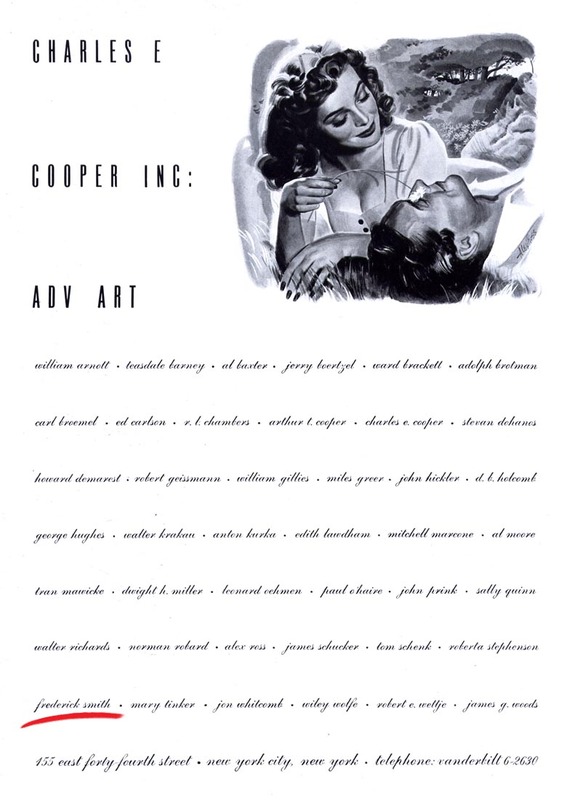 If Sheilah remembers being the first female illustrator at the Cooper studio ( and she would certainly know, since she worked there in her studio room next to Chuck) then I wonder what the arrangement was with these other mystery women? Below, a Sheilah Beckett DPS ad from a 1960 issue of the Saturday Evening Post. This would have been a relatively rare ad assignment at that point in time. "When television came in," explains Sheilah, "that really made things difficult... there wasn't as much illustration. 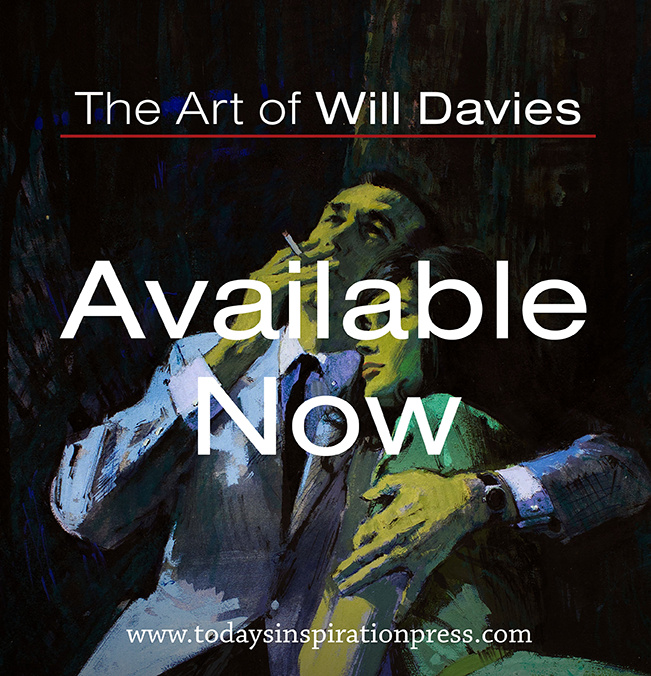 Even in advertising there wasn't as much, so business at Cooper's petered out." "I worked with Chuck Cooper until he died - after Cooper's was no more. "But it was such a wonderful place with such wonderful people... very creative people!" The women listed in the cooper studio catalog worked in the office one was Chuck's assistant and one was in charge of the reference library another booked models for photo shoots. What a wonderful insight on Sheilah Beckett in her own words.. even more impressive, since she had no art school training, and yet forged her own way into the top rungs of illustration. There is a lot of stereotyped myths and false impressions about the mid century period. However, these recollections from those that were in the trenches like Sheilah Beckett, shed some deserving light on the positive side, which doesn't surprise me . Her recollections of working at Coopers Studio is very similar in many respects to Barbara Bradley's stories, and others I have read about. Thanks Leif, for another informative and fascinating post. "I loved doing Christmas cards..."
She loved doing what she did. It shows! That's so cool, Sheilah Beckett is so amazing! Sheilah never attended art school... she is entirely self-taught. She began working immediately when she graduated from high school. Her first job was creating advertising artwork for a Portland area department store.